Indian Prime Minister Narendra Modi, right, and Maldives President Ibrahim Mohamed Solih arrive for a meeting in New Delhi, India, Monday, Dec. 17, 2018. Narendra Modi reached out to all of India’s neighbors after being elected as prime minister in 2014. He visited all the neighboring countries, with the exception of the Maldives. His planned visit in March 2015 had to be cancelled due to the worsening political conditions there. In fact, Yameen’s largely anti-India approach severely frustrated the Modi government’s neighborhood outreach. The presence of Modi at the swearing-in ceremony of Solih as the president of Maldives in November – Modi was the only foreign leader to be present – is clearly indicative of India’s eagerness to befriend the new leadership. 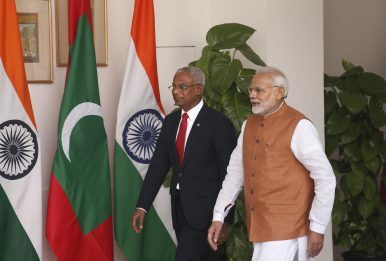 During his maiden India visit, Solih not only emphasized his country’s traditionally close ties with India, but also affirmed his government’s “India First Policy.” India reciprocated the gesture by announcing an assistance of $1.4 billion through a credit line and budgetary support to the Maldives. Enhancing cooperation in the Indian Ocean Region, particularly in the maritime security domain through coordinated patrols and aerial surveillance, was the centrepiece of Modi-Solih discussions. Solih’s success in the Maldives is essential for New Delhi for the simple reason that his pro-India inclination has the potential to ensure a much-needed course correction in the country’s foreign policy. His predecessor sought China’s financial assistance and came out openly in support of the Belt and Road Initiative (BRI). By signing a controversial free trade agreement (FTA), and favoring Chinese companies for undertaking major infrastructure projects, Yameen also discarded closer security ties with India. This was viewed in New Delhi as part of Beijing’s backdoor attempts to encroach on India’s influence in the Indian Ocean. China has been building roads, bridges, and ports across the Indian Ocean, including the recently-acquired Hambantota port in Sri Lanka as the latter accumulated unsustainable debt. When Modi and Solih “reiterated their assurance of being mindful of each other’s concerns… and not allowing their respective territories to be used for any activity inimical to the other,” it is difficult to ignore the unmistakable reference to China. There have been growing concerns regarding China’s role in the Maldivian economy through so-called “debt-trap diplomacy.” According to one estimate, China’s loans to the Maldives total more than $1.5 billion, which is a quarter of the country’s GDP. Solih wants India to play a bigger role in correcting this anomaly by giving financial support to his country. India is equally keen to lend a helping hand so that it is able to regain the space it lost to China. A section of Indian establishment now hopes that the new government in the Maldives will either roll back some of the China-linked infrastructure projects or put them in cold storage. Although Solih has indicated that his government is in the process of revising the FTA with China, it seems unlikely he’ll engage in a radical policy shift or seek to push off all Chinese engagement. Moreover, it is also not prudent on India’s part to expect the Maldives to shut all its doors to China. Geographical proximity as well as traditional bonds of friendship would invariably put India in the leading position in the policymaking dynamics in the Maldives, but not eliminate China for the same reasons. Despite repeated calls for intervention, India firmly avoided military action against the Yameen regime. New Delhi thoughtfully coordinated its diplomatic response with other stakeholders, and put enormous pressure on Yameen to hold the presidential elections in a fair and transparent manner. This patience seems to have yielded a positive outcome as India finds itself in an advantageous situation now. The biggest challenge before Solih is to restore institutional credibility of all major institutions, which were discredited during Yameen’s tenure. Keeping together the disparate forces that ensured his stunning electoral victory will not be an easy affair for Solih. Growing Islamist radicalization has already made matters difficult for the country. Cracking down on institutionalized corruption should be a priority area for the new government. Clearly, the road ahead for Solih is not easy as he would require India’s constant support to surmount the challenges that the Maldives faces. Vinay Kaura is an Assistant Professor in the Department of International Affairs and Security Studies, Sardar Patel University of Police, Security and Criminal Justice, Rajasthan. The Maldives Election: A Renewed Chance for India?India’s Role and China's Roads in the Indo-PacificThe China-Maldives ConnectionIn India’s Elections, Voters Will Choose Between Guns and ButterIndia and the Maldives: Back on Track?